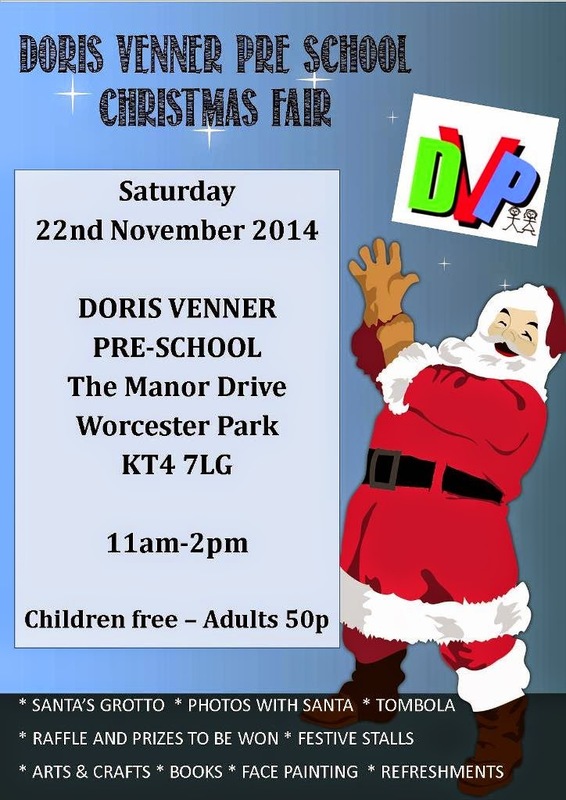 The next cab of the Christmas fair rank is the Doris Venner Pre-School Christmas Fair. This one is on tomorrow (Saturday 22nd November) from 11 until 2. It will cost you a smallish silver coin (or 50 very small copper ones) to get in if you happen to be of the adult persuasion. However those not in this category may enter without payment. "A fun-filled event for all the family, with a host of activities. Browse the festive stalls, try your luck on the tombola, enter the raffle and be in with a chance of winning some great prizes. Children will be able to meet Santa and have their photo taken with him in his grotto." So if you can't put off the Christmas spirit any longer (or you just want to check whether Father Christmas managed to finish putting on his gloves), get in the festive spirit at the Doris Venner Pre-School (The Manor Drive, KT4 7LG) Christmas Fair tomorrow.